A Duct Tape Marketing Consultant will bring you a holistic, systematic approach to marketing and not the parts and pieces you may be trying to put together with vendors. The certified consultants have a repeatable, consistent approach and they always start with strategy, and then, they align it with a total online presence. The online presence includes your website, social media, SEO, content and email marketing, all of which work together as tactics to support the overall strategy. 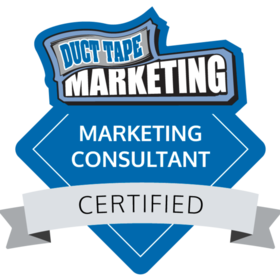 A Duct Tape Marketing Consultant has completed an extensive online certification process containing modules and lessons covering every element of small business marketing today. This training is coupled with Core in-person training and testing. Certified members also participate in an ongoing business and marketing development curriculum designed around relevant and evolving marketing topics. This badge ensures you are working with a fully trained marketing professional.